HamItForward - A better way to Elmer people into ham radio! The fastest and easiest way to grow your club! Imagine a world where clubs are freed from the drudgery of teaching to the exam, but are free to excite and inspire their students with real-life stories and practical information about ham radio. Let us teach the exam, and let your hamstructors teach how to select radios and antennas, program handhelds, what (and what not!) to say on the air, public service, Field Day, contesting and awards, chasing DX, DXpeditions, and a dozen other topics they are eager to learn! the best practices, a collection of ideas that have helped other organizations hold large and successful classes. Think back. For most of us, someone gave generously of their time to help us get started in ham radio. In many cases it's impossible to pay them back, and they probably don't want any kind of compensation, anyway. A better way to honor your Elmer is to Ham It Forward™, and we'd like to help! For clubs, schools, and other organizations that use the Ham It Forward™ method, where students use the HamTestOnline™ website for exam preparation, and the hamstructors focus primarily on the practical aspects of ham radio, we will give $5 off each Technician course, with a minimum of 5 subscriptions per order. That's just $24.95 per student. We recommend that you also bundle a free one-year club membership to class participants to encourage these new hams to become active in your club. News flash! We are currently having a Ham It Forward™ sale! Through 4/30/2019, every student gets the $24.95 Ham It Forward™ discount price on every Technician course we sell! No minimum purchase quantity! No need to contact us by email! Just purchase online, and you will automatically get the Ham It Forward™ price! Email sales@hamtestonline.com, indicating how many Technician courses you wish to order. Minimum 5 Tech courses per Ham It Forward™ order. We will email you an invoice for requested courses. Once we receive payment notification for the invoice, we will email you instructions and subscription codes, which you can distribute to your students. Here are some tips and techniques that have helped other organizations hold large and successful classes. 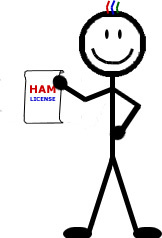 Email us at support@hamtestonline.com, and tell us what's worked for you! Take advantage of free publicity by asking your local papers and cable TV stations to announce your upcoming classes. Ask every club member to invite at least one family member, co-worker, or friend to the class. Make the class free, with the club paying for the Ham It Forward™ subscriptions, and the students responsible only for the exam fee. Assign an Elmer to each student, someone who can get answers to any questions they might have. Give each student a Ham It Forward™ subscription code for the Technician course on the HamTestOnline™ website. They will study at home with the online system to prepare to pass the exam and get the license. They will learn during the classroom sessions what they need to know to actually get on the air. Make sure they know the date of the upcoming exam session so they can schedule their online study time appropriately! Make sure your Elmers stay in touch and find answers to any questions the student may have. Encourage the students to attend club meetings even before they have graduated from the class. In fact, if your club meeting falls on a class night, you could have the students come to the club meeting either immediately after, or in lieu of, the class that one night. Make sure the hamstructors talk about a wide variety of interesting ham radio topics. If one or two students are struggling with some particular exam topic, don't make the entire class sit through lengthy explanations. Chances are that most students understood it from their online studies, and some of them may get bored and drop out of the class and the club. A better solution is to have those tutoring sessions one-on-one outside of classroom hours. Of course, your students are also welcome to email us at support@hamtestonline.com with questions about the online course materials! Check with the students during every class session to make sure they are progressing through the materials. However, don't be too hard on the slow starters, since some people will inevitably cram for the last couple of days before the exam session and still pass! Encourage those who move through the materials quickly to go ahead and study for the General, and possibly the Extra, as well. (Let them pay for the additional courses.) One major advantage of online courses is that each student can progress at his or her own rate! HamTestOnline™ is an extremely effective study methodology, and many of our students pass two, or even all three, exams in a single sitting. Schedule an exam session just 2-3 weeks after the start of the class. Most students only need 10 hours of online study to be ready to pass the exam. Students who concentrate that study into a relatively short period of time are much more likely to stick with it and pass the exam. Drawing it out for a month or more is a motivation killer. Remember, the Tech exam is not that hard! Rather than choosing a time that is convenient for your VEs, consider scheduling the exam session on a Saturday evening or Sunday afternoon. That allows your students to study for several hours immediately prior to the exam. Make sure the students and the Elmers keep focused on the exam date. There is no stronger motivation to study than knowing that you have an exam date looming! Bundle a free one-year club membership with the class. Have the Elmers keep in touch with the students even after they receive their license. Make sure they feel encouraged and welcome to attend club meetings. Consider devoting a section of the next few club meetings to helping the newcomers. For example, you could have an HT "show and tell" segment where the newcomers can learn the pros and cons of various models, or for those who have already bought one, you can give hands-on help programming them! Don't lose the momentum! Consider continuing with the classes after the exam session, shifting the focus to passing the General and Extra exams and getting on HF. This could follow a similar format, with the students preparing for the exams online, and the hamstructors talking more about HF. Holding another exam session on a Saturday evening or Sunday afternoon about five weeks after the Technician exam will give the students time to enough prepare to pass both the General and Extra exams if they desire. Consider holding Morse code practice sessions if enough students express interest in learning CW. Consider forming an "antenna raising" group to help build and/or put up antennas for the newcomers who progress on to General or Extra, or those who want to practice CW on the Novice bands. Consider having a "newcomers net night" to give your new hams an opportunity to experience net operations in a low-pressure situation. Schedule some kind of special event (Field Day, State Fair, etc. ), and encourage the new hams to operate.